Farm-City Week is a nationally observed time set aside to celebrate the important connections between agriculture-related industries and urban lives. It is traditionally observed the week before Thanksgiving. This year’s Farm-City Week Event will kickoff with an Ag Expo at The Music Man Square Streetscape. Following, event-goers will then move into the Reunion Hall for lunch, featuring locally-sourced products. 12PM - Program: "Who Wants to be a Farmer?" The program will test our local business leaders’ Ag knowledge. 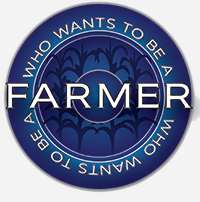 Watch a panel of ‘celebrity’ contestants compete in the educational game show, “Who Wants to Be a Farmer?” You might even be tapped to participate! This is an event you won’t want to miss! *20 booth limit. Booth must be educational, ag related, show an impact on the community, and show interaction between farm and city.